This entry is going to encompass a long weekend's worth of shooting. 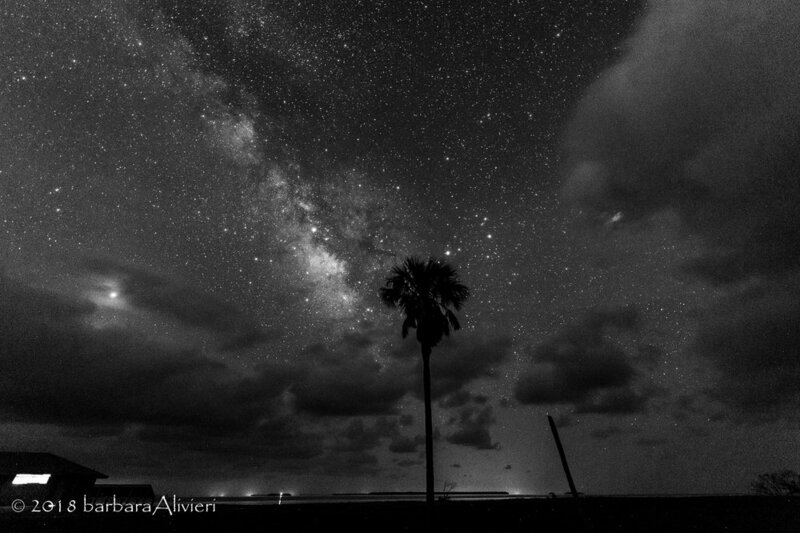 The Perseid meteor shower was coming up. The camera club was going out on Sat. Aug. 11th and it was going to be PERFECT! It was a new moon, no moon, the weather was going to be great, hot but great, and the peak of the meteor shower was that and the next night. I was stoked! I even rented a special lens for the weekend, the Sigma 14mm f1.8. Fast and sweeeeeet! So I went out the night I got my lens. Thursday the 9th. There was rain and clouds all over south Dade, but, but... not in Flamingo! And the storms seemed to be moving straight south. I took a chance and sped my way as fast as I could to get to Flamingo in time to focus on something with light. (Of course I didn't pre-focus... where' the fun in that? *rolling eyes*) But on my way I saw the most spectacular sun set. It was amazing! Every turn I made I could see this setting sun. Spectacular. I say to myself, "why don't I come down here after work more often!?" I make a pledge to do just that. I've done it twice so far. Need to go more until the sunset is just not doable with the time it takes to get there. So I finally make it to Flamingo. The sun has well set and it was near dark. I pulled in all the way to the group camping area. There's one lone camper. Off to the east of the furthest bathrooms. They must have wondered what the hell I was doing out there. LOL Just as I wondered what the hell they were doing out there. It was so miserably hot! And not to mention the mosquitoes. Ufff! I suppose the lights after Irma were knocked out so I had no light to focus my lens with. Another uffff! But I eventually found I think Jupiter off to the west and I focused on that. Thank God it worked! I turned to the south-southeast and waited for dark dark. I gotta say, I loved how fast it was, but not the wide angle. It just distorts everything that's not in the center of the lens. And when you're angling your lens up toward the stars, all the foreground elements you were hoping to include looked like it was designed by Picasso himself! I don't know. I guess I'm too much of a novice to fully understand the ultra wide angle lens. But I'll get there. Hopefully by next year's (or maybe even December's) meteor shower, I'll know better what to aim for. But I did get a few milky way. Sharp and sharp, and did I mention it was sharp?! I mean with I can shoot a 10 second exposure and get great stars, I was impressed. Now, make an 18 or 20mm f1.8 and I'll be HAPPY! So all in all, it wasn't a bad night. Back out to the 'glades again. This time Cheryl from the club joined me. She just bought the Nikon 14-24 f2.8 SweeTT! So we went to the Anhinga Trail this time. We both got stuck in some hellacious traffic. It was nasty storming. But, the sun set and gave us a little rainbow! So I took advantage of the thick fast moving clouds to do some timelapse. They are fun because you can set up and then let it do it's thing for a good 10 minutes to a couple of hours if you like. Then you just chat and check facebook etc. LOL It's fun with a friend. By about 10ish, the clouds were getting thin so we both turned toward the south. Hoping to get a milky way. You know you hear all the rules of night photography but once in a while you have to ignore them! I learned that my first time out. I had a "kit" lens and 'oh no, gotta have a f2.8 or faster', or you need a this or that and the darkest skies etc. 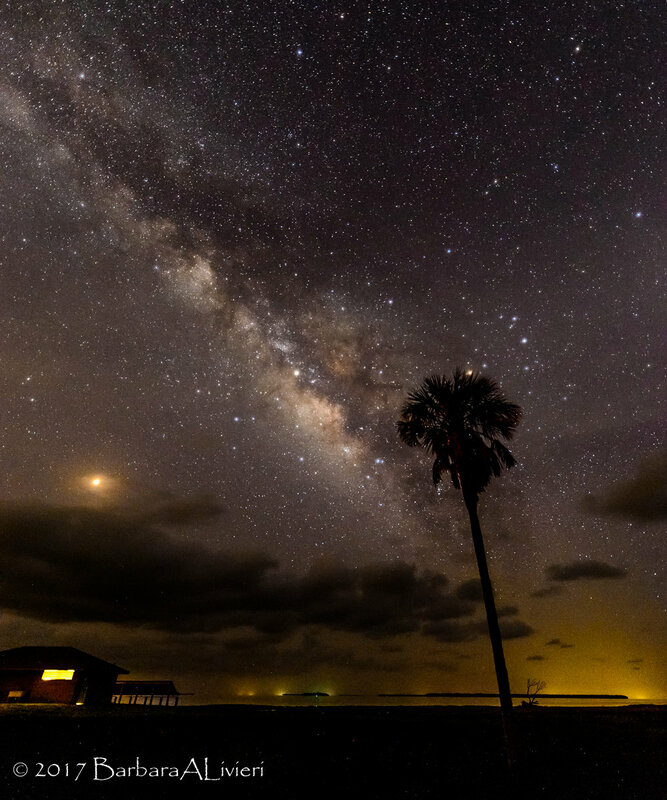 Well, the Anhinga Trail is fairly close to metro Miami and not ideal as far as dark skies are concerned, but hell, we got the milky way anyway! So I continued on with a milky way timelapse. Got some pretty neat images too. Even a meteor! Who'd a thunk it?! Here's the video I did with all of the timelapses for the night. Later on some young people drove up and ruined our shots with their headlights and flashlights so we decided to call it a night. We had another big night coming up! The big night, the camera club met at the parking lot of the visitor's center and we all discussed where we were going. Then we all caravanned to the Mahogany Hammock Road. We were deep in the Everglades. Lots of new people were along, I was worried about lights so I pulled way down to the end of the road. Delfin was there so we enjoyed our time. Unfortunately, too many cooks spoiled the broth as it were. Way too many people and too many who didn't have control of their lights. Flashlights, car lights, red lights. People driving through, it was a mess. And it was sooo humid. Condensation accumulated on my lens, and of course my lens warmer battery was kaput! So I went to m y old standby the hand warmers, and those too were kaput! The best part though was I was with good company and we enjoyed ourselves. I did manage to get ONE meteor worth showing off. The rest was ho hum. L to R Mars, Milky Way (incl Saturn) a meteor, and then Jupiter! All we needed was Venus to make this a party. Around midnight many of the group we heading out. I stayed on and turned north to see if I could get some star trails. I got a lot of headlights and taillights but it was still pretty neat. Polaris (north star) and ring around the rosey! The long lights are just airplanes. After the crowds left I decided to get some silhouette shots from the trees way ahead of me. And no, that's not a sunrise, that's the glow of the greater Miami area. That's how bright the light is some 25-30 miles away. Hell, we could even see a minor glow off to the northwest of Naples! And one last one showing the roadway. I really liked this one. I may have to dig in and process this a little better. Here's a timelapse video I made from the night. Not as good as the night before, but it tell the story. So this is basically all for our meteor shower weekend. All in all a great weekend, lots of photos, lots of fun with friends, and I'm glad its over. Definitely in need of sleep.